For a striking architectural addition to any building, an exterior dome from Stromberg is the way to go. Possible choices include onion domes, coffered domes, cupola domes and semi-spherical shaped domes. 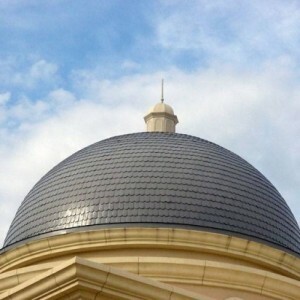 Dome applications vary widely as well; they work well on government buildings where they add a sophisticated touch. Place a Stromberg exterior dome on a church for that refined look; they also look good on hotels, resorts and even some private homes. Stromberg is the world’s largest producer of domes of all types; they can handle your project no matter the size. You’ll be impressed with the assortment of materials, textures and finishes they can offer you as well. GFRC is a durable, dependable material that stands up to all kinds of weather and temperature conditions such as high winds and extreme heat or cold. Exterior domes by Stromberg are securely attached to your structure with bolt or screw flanges. Because of the virtual indestructibility of GFRC, you’ll see Stromberg domes in use all over the world. Glass fiber reinforced concrete (GFRC), uses glass fibers for reinforcement instead of steel, therefore it’s much lighter than traditional precast concrete. The lightweight quality of GFRC makes it an exceptional choice for your exterior dome, no matter what kind of structure you choose to place it on. The glass fibers in GFRC won’t rust, so you won’t need to invest in a protective covering of concrete; and you can be assured that glass fiber reinforced concrete from Stromberg is top-of-the-line. Stromberg exterior domes in GFRC are available in a wide choice of colors and textures. They can be painted to match surrounding surfaces, as well as given smooth or stone textures or an aged copper or bronze look. GFRC exterior domes are very durable due to high strength materials. GFRC is flexible and is a good dome choice in earthquake prone areas. Glass fiber reinforced concrete is fire resistant. The professional team at Stromberg Architectural Products will provide you with their talent and expertise to see your project through to completion. Stromberg is here to help with CAD details, design assistance and specifications. Contact them today at (903) 454-0904 for a free custom quote, and put their 30 of experience to work for you.